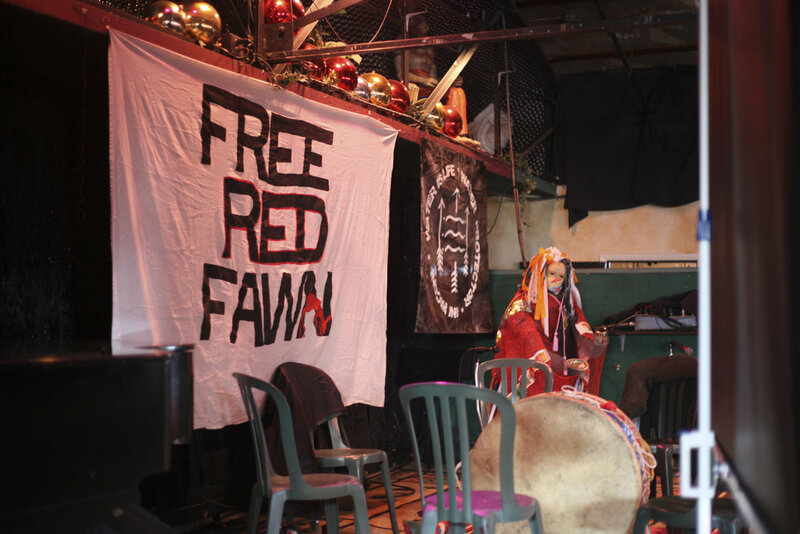 The Red Fawn Support Committee exists to promote justice for Red Fawn by advancing and facilitating the activities of her supporters worldwide. We do this by keeping you updated about Red Fawn's legal case, her situation, and the most effective ways to provide the support she needs to overcome and emerge victorious over the challenges placed in her path. On Tuesday, America’s vast army of incarcerated men and women – at 2.3mof them they form by far the largest imprisoned population in the world – will brace itself for what has the potential to be the largest prison strike in US history. BUFFALO, S.D. — In the last few weeks up in windswept Harding County, sheriff's deputies have driven down long, dirt roads to serve court papers to landowners, announcing whether they like it or not, TransCanada would be running an oil pipeline onto their land. Lower Brule, SD — Today, a federal court ruled the State Department must conduct an environmental review of the Keystone XL pipeline route in Nebraska. Last November, the Nebraska Public Service Commission (PSC) approved a “Mainline Alternative” route for the pipeline through the state. Tribes and landowners have since challenged the PSC decision. The federal court ruling is a strong affirmation of their claims and an impediment to the TransCanada corporation pipeline. Chants of “St. James needs an evacuation route!” came from the dozen-plus activists gathered at Louisiana Radio Network on July 18. The activists were part of the L’Eau Est La Vie (“Water Is Life”) camp, in Rayne, Louisiana. They want to stop the construction of the Bayou Bridge pipeline in Louisiana from St. Charles to St. James, through the Atchafalaya Basin. They were at the Radio Network because they want to get the attention of Lousiana Gov. John Bel Edwards, who was holding his monthly radio call-in show there. They believe that the struggle against the pipeline is inherently connected to the struggles against extractive capitalism and White nationalism, and the movements for Native rights and Black lives. The CEO of Energy Transfer Partners said Monday he hopes to announce an expansion of the Dakota Access Pipeline soon. Kelcy Warren, CEO of the company that developed the $3.8 billion pipeline, participated in a roundtable discussion with U.S. Energy Secretary Rick Perry and other energy industry leaders at the University of Mary in Bismarck. Early July marked two very different approaches to justice. One towards Native people and another towards non-natives Steve and Dwight Hammond, who were convicted in 2012 of setting fires that spread on government-managed land near their ranch in Oregon. 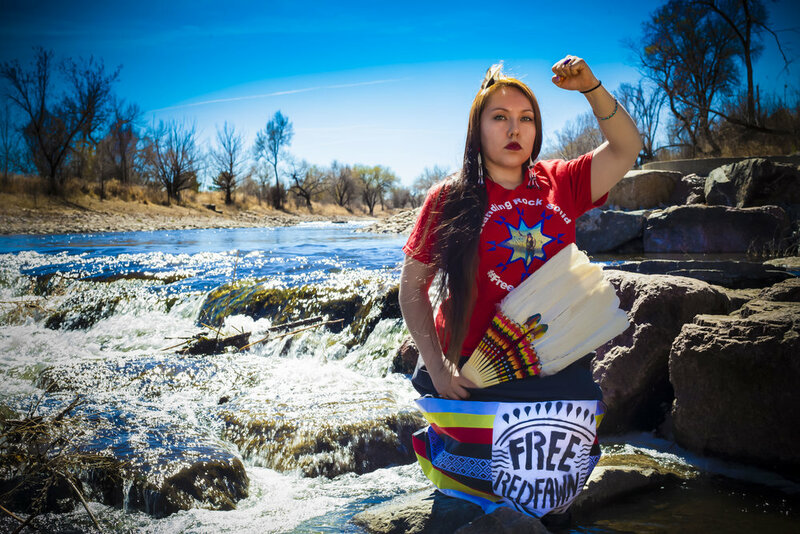 On July 8, Water Protector Red Fawn Fallis was sentenced for her involvement as a Water Protector at Standing Rock. Judge Daniel Hovland sentenced Red Fawn Fallis to a total of 57 months in federal prison. She received a credit of 18 months ‘time served’ based on her time in North Dakota jails. Red Fawn’s case has been a major concern to Water Protectors. Despite over 800 arrests, the commitment to non violence was consistent. The case against Red Fawn had centered around allegations she fired a gun during her arrest on October 27, 2016, during a massive military raid. The gun allegedly fired by Fallis was later revealed to have belonged to Heath Harmon, an undercover FBI informant who was romantically involved with Red Fawn at the time of her arrest. Ellen Gerhart sat in leg irons and cuffs, a guard standing behind her, as Houston-based pipeline giant Energy Transfer Partners made its case against her on Friday in a Pennsylvania courtroom. Seconds after Huntingdon County Court of Common Pleas Judge George Zanic found the 63-year old retired teacher guilty, he began the sentencing phase of the proceeding, reading from a prepared statement on his computer. Zanic sentenced Gerhart to two to six months in the Centre County Correctional Facility about an hour away from her home. August 3, 2018, North Dakota – Today, a federal judge blocked Energy Transfer Partners (ETP), the corporation behind the Dakota Access Pipeline, from continuing a lawsuit against Earth First!. ETP had filed a sprawling lawsuit, claiming the environmental movement Earth First! had funded a violent terrorist presence and criminal enterprise at the Standing Rock protests, with $500,000 and proceeds from drug sales on the site, and had conspired with Greenpeace and other environmental groups to deceive the public about the environmental risks of pipelines. Today, the court rejected ETP’s allegations as factually unsupported. The judge also blocked ETP’s attempt to collect discovery against the Earth First! Journal, a non-party in the suit. In a moving ceremony filled with song, word and action under the shadow of Chief Joseph Mountain, The United Methodist Church took a small step toward righting an historic wrong on Wednesday. As 115 people gathered from the Nez Perce Tribe, United Methodist Church, camp supporters, and community, The Oregon-Idaho Conference returned a 1.5 acre parcel of land in Oregon to the Nez Perce nation. Two federal defendants indicted in connection to the Dakota Access Pipeline protests have accepted plea agreements. Both deals with federal prosecutors are similar: Dion Ortiz and James White will each plead guilty to civil disorder, while prosecutors will move to dismiss charges of use of fire to commit a federal felony — similar to related defendants' plea deals. She is keeping active taking care of her elderly relatives and has been working for a few days in the kitchen. We are still waiting to see if she will be relocated closer to her family. It has been hard for her not to be able to see her family and requests have been made for visitations but that process takes some time. She has been there 4 months already. We all continue to be patient while making steps to make sure she is ok. She mentioned to us that she is EXTREMELY THANKFUL to recieve your letters, the good reads, articles, paypal contributions and most of all, your continues prayers, love and support. This is huge medicine and gives her strength. In prison an inmate has to pay for so much--toiletries, snacks, phone calls, emails, stamps, and on and on--and at greatly inflated prices. It’s a real strain on the person’s family and friends--but less so if everyone helps out! You can send money using MoneyGram, Western Union, or the post office. Many people find that using Western Union works well for them, so we’re including more information about this method. From this screen you’ll be directed to set up a payment account with Western Union, and you’ll need to use a credit or debit card. After short stays at Stutsman County Correctional Center (Jamestown ND) and the Federal Transfer Center in Oklahoma City, Red Fawn has arrived at FMC Carswell, in Fort Worth, Texas. This is apparently where she will be incarcerated, at least for a while. Red Fawn, ever strong and courageous, has assured those she's spoken with that she is doing ok despite all the ordeals facing her. We know you love Red Fawn and want to support her in any way you can. In the near future we'll provide more information on different ways you can do this while she's at FMC Carswell. Meanwhile, remember that Red Fawn always asks you to send up your prayers. And also remember that your greetings--reminding her that you love her and are thinking of her--are what will encourage and sustain her, both now and throughout her incarceration. "I stand in peace in prayer and in solidarity with our relatives through every struggle. Remember the strength and the lives of our ancestors, they suffered way more for the right to pray to speak our languages and to simply eat and sustain our lives as well as their families lives. One heart One mind One prayer... Mni Wiconi.... Love and strength.... From Cante Waste Wi - Good Heart Woman Oglala Lakota Protector... Lilililililili"
Growing up in Colorado and Pine Ridge, South Dakota, Red Fawn was raised in traditional Lakota ways, grounded with love and a deep connection to the earth and all things sacred. Her mother, Troy Lynn Yellow Wood, taught her the importance of fighting for social and environmental justice, and standing up for her people. Red Fawn is a loving daughter, auntie, niece and friend. While at Standing Rock, she served as a trained medic, continually rescuing and caring for her fellow Water Protectors. She also earned the deep love and respect of the Indigenous youth in the camps, who looked up to her as an example and mentor. 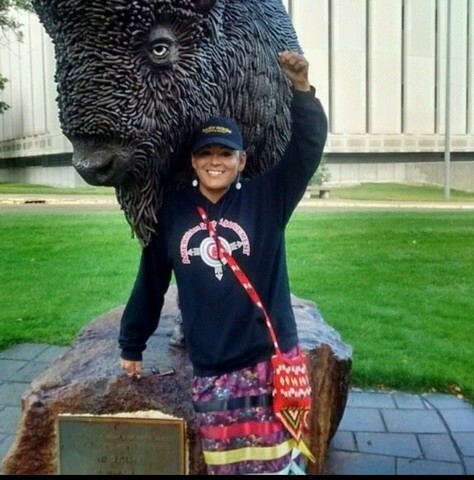 Red Fawn wearing Water Protector skirt at a rally at North Dakota State Capitol in Bismarck, 2016. When the Dakota Access Pipeline (DAPL), owned by Energy Transfer Partners (ETP), occupied 1851 Fort Laramie treaty territory of the Oceti Sakowin (Seven Sacred Council Fires of the Great Sioux Nation) in order to put a crude oil pipeline under the Mni Sose (Missouri River), Red Fawn was quick to respond. 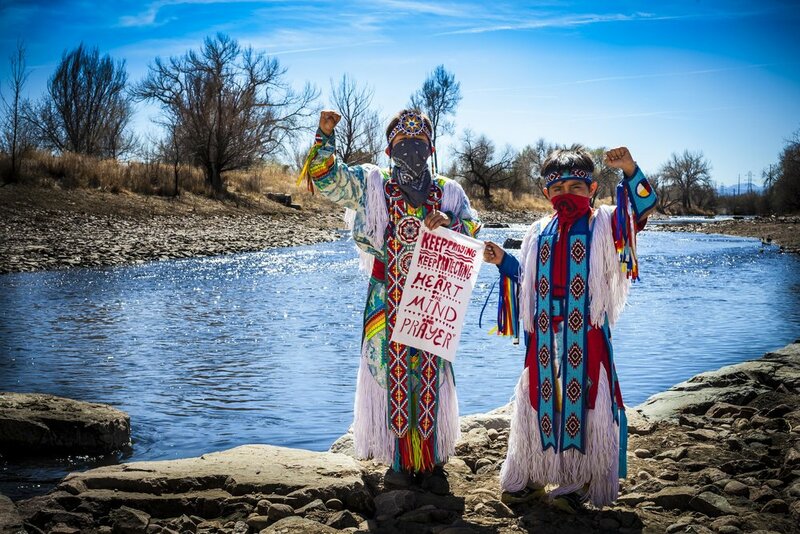 She joined other Lakota people who were gathering together to assert their treaty rights and protect the source of precious drinking water for themselves and for 16 million people downstream. Standing with her for the rights of Indigenous people and our Mother Earth at Standing Rock were many thousands of people from around the world, including representatives of over 300 sovereign Indigenous nations. Red Fawn was one of over 140 Water Protectors arrested at Standing Rock on Oct 27, 2016, while peacefully exercising their first amendment right to oppose construction of the Dakota Access Pipeline (DAPL) on treaty-protected land. But she was one of only a handful of people who received serious federal charges. As reported by the publications the Intercept and the High Plains Reader, leaked documents have revealed that Red Fawn had been targeted for surveillance and possible arrest by a sprawling intelligence operation that included ETP, TigerSwan and other private mercenary firms hired by them, the FBI, and various levels of law enforcement--all conspiring to discredit and derail the growing resistance to the pipeline. Leaked documents also revealed that the gun Red Fawn was accused of firing belonged to Heath Harmon, an FBI informant who had infiltrated her camp and managed to become her romantic partner--and who had been with her throughout the day she was arrested. A recent Intercept article helps explain the factors which convinced Red Fawn to take the plea. Based on several pretrial motions denied by the judge who would have tried the case, Red Fawn and her attorneys became convinced her case would not be fairly presented at trial. Among these rulings: they could not argue that the law enforcement operation on Standing Rock land was illegal based on treaty rights. The government did not have to turn over information about Harmon or other covert operatives involved in the case. Nor did they have to address the legality of law enforcement’s close collaboration with TigerSwan, a private security firm hired to protect the pipeline. Hello dear friend of Red Fawn! We are writing to you because you have demonstrated your love and solidarity with our brave sister, auntie, friend and relative Red Fawn Fallis in the past--by hosting or attending fundraising/honoring events, donating auction items, writing to her, providing financial support, and in so many other important ways. Today we want to update you on Red Fawn’s case, let you know how she’s doing, and suggest some actions you can take now to continue to STAND WITH RED FAWN, particularly in the days leading up to her sentencing hearing in Bismarck, North Dakota on June 25, 2018. In January, 2018, feeling pressed into a corner by these efforts and facing the possibility of life in prison following a trial in which she did not believe justice would prevail, Red Fawn reluctantly entered into a plea agreement. Through this agreement, the most serious charge was dropped and her sentence was capped at no more than ten years, with the prosecution recommending seven years. For those who may question Red Fawn’s decision to take a plea rather than go to trial, it is important to understand, not only her individual case, but also the extent to which her case exemplifies a system which is aligned against criminal defendants. The article, Why Innocent People Go to Jail, by Jed S. Rakoff (listed at the end of this letter), provides the context we need to begin to fathom the profound injustices embedded in our current “criminal justice” system--a system in which, in 2013, 97% of all federal criminal charges were resolved through plea bargains. At Red Fawn’s sentencing hearing, North Dakota District Chief Judge Daniel Hovland will hear testimony from both sides. It’s likely, but not certain, that her sentence will be handed down at this time. Through all her long ordeal and incarceration, Red Fawn has remained heart-strong, patient, and steadfast about the justness of her cause. As you can imagine, though, her anxiety level is very high as she approaches the day when such an important decision about her future will be made. We know you want her to feel your presence, love, and solidarity today, on May 31st, and throughout whatever follows. Here are some things you might do to STAND WITH RED FAWN. Send love and prayers to Red Fawn during her sentencing hearing. This hearing will take place starting at 9am on May 31st at the Federal Courthouse, 220 E Rosser Avenue, in Bismarck, North Dakota. While Red Fawn would greatly appreciate people to be at her hearing, she understands that, for most of us, traveling all the way to North Dakota for this one-day event is beyond our reach. Also, her family and closest friends will of course receive priority seating in the small courtroom. So others who come take the risk of being seated in an overflow room, or without any access to the hearing at all. So, if traveling to the hearing isn’t feasible for you, be with her in spirit by sending her your prayers and love on this day. Also give strong consideration to the other important ways you can lend your support. Send a letter of support which will positively influence the judge’s sentencing decision. Do you know Red Fawn well enough to give specific examples of how she has demonstrated such positive qualities as integrity, trustworthiness and peacefulness in her past actions? If so, please consider writing a letter vouching for Red Fawn’s good character and reputation. Such a letter can go a long way toward encouraging the judge to make a sentencing decision that is helpful to Red Fawn. Guidelines for writing a support letter are attached. If you are in a position to write such a letter, make sure to send it to the attorneys representing Red Fawn, and NOT to the judge. Her legal team will decide which letters to give the judge, based on their helpfulness to her case. Also, be sure to talk only about her positive character, as demonstrated by her actions in the past. DO NOT discuss the facts of the case, and DO NOT include political arguments, slogans or messages. Such letters will not help her case and could significantly HARM her. Also remember that her hearing is coming up soon, so be sure to write and send your letter today! And here's where to send cards and letters to Red Fawn. Remember that your greetings--reminding her that you love her, and that she is in your thoughts and prayers--are what will encourage and sustain her, both now and throughout her incarceration. Pray for Red Fawn-- and water protectors all over the world. Stay informed about Red Fawn’s case and related matters. Visit the new website https://www.standwithredfawn.org. In particular, read the beautiful letter which Red Fawn wrote and which was read at the United Nations in April. Red Fawn Fallis is an Oglala Lakota activist who was arrested at Standing Rock on charges of firing a gun and faced life in prison. After spending over a year in jail awaiting trial, she has accepted a plea bargain and now faces up to ten years in federal prison. Under the terms of the agreement, Red Fawn pleaded guilty to two charges, while the third charge, which carries the most serious penalty, has been dropped. 38-year-old Red Fawn says that she has chosen to spend the next few years healing and moving forward rather than risk life in prison or decades of appeals. Red Fawn and her supporters believe that due to a system of injustice, extreme racism against indigenous people, and mass incarceration, she could not get a fair trial in Fargo, North Dakota. Hello relatives, my name is Red Fawn I am a Oglala of the Lakota people from Pine Ridge South Dakota. My Ina (my mother) TroyLynn YellowWood a Oglala, Shaheila, raised me in Denver Colorado since I was an infant. Pila'miye 'thank you' for the opportunity to share some words today, I was honored and humbled when I was asked to write something to be read on my behalf. I would like to share some teachings from my Ina (mother) and my Unci (grandmother), they have both passed on but continue to give me strength and courage to keep on the good path the red road, meaning to remain in prayer, to help the people, to be humble, and to always honor our relationship to mother earth, to the water, to one another, to life and all the livings things. I went to Standing Rock in august 2016, with love and understanding that we should always do whatever we can to protect all things sacred. Our youth started the Mni Wiconi prayer to protect Mni Sosa the Missouri river and our sacred territories from the black snake otherwise known as the Dakota Access pipeline. We came from all around the world, from all nations, to join the prayer, we found something bigger than life, a spiritual fire we will carry with us til the end of time. We found a way to honor our relations with one another, with the land and the water. We answered our ancestors prayers and honored their teachings. I was raised being taught these traditional and spiritual values by my grandmother, my mother and other women in my family. My grandmother, my mom, my oldest sister, my oldest niece and her first born son were the beginnings of the 5 living generations in my family until march of 2016 when my grandmother passed on and then in June 2016 when my mother passed on, which left our family without the two pillars of love, strength, honor, spirituality and humility. They were both story tellers, that was how they passed on the wisdom they gained throughout life. My grandmother spoke Lakota and taught us how to bead and sew our traditional clothing, she taught us Lakota songs; her greatest teachings were of humility, selflessness, laughter, dancing and always honoring our relations. My mother taught who were are and where we come from by teaching us spirituality, through prayer with the Canupa, the sacred Lakota ceremonies, by taking us with her while she sun danced. We grew up going to sweatlodge and many other traditional ceremonies. She taught us the songs, how to do things in a respectful manner. She taught us to stand up for our beliefs and for our people with a strong heart, in peace and in prayer. Her greatest teaching was her life, the way she lived. She walked the red road she was a pipe carrier, she lived in sobriety and believed in our sovereignty as Shaheila and Oglala Lakota people. She stood on the frontlines in solidarity with all nations, in peace and prayer for the struggles of the people. She taught us these things by example since young adulthood to the last months of her life. She was always helping everyone in every way she could, these are the teachings she passed down to her children as well as many many others around the world. I am thankful for these teachings, they carry me through the hard times in life.. She taught us resilience and strength. I am proud of all our brothers and sisters who stand up against the injustices being committed all around the world that are killing our people, contaminating that land and water, robbing our future generations of these gifts from creator that are here to sustain life one generation to the next. I ask, what must we do to be a good caretaker of this land, to be a good relative, to protect all things sacred, to ensure that our future generations carry love, strength, compassion and the knowledge of how to care for the earth, for each other, and for their future generations? It's important as first nation indigenous people, as protectors, that we no longer be idle, we must honor these teachings. We have a steady growing unknown number of missing and murdered women, children, and men. I am honored to know that so many strong heart relatives are out the speaking up and carrying the names of our missing and murdered loved ones. My prayers and strength go out to all who are bearing this pain. We have a suicide epidemic amongst our people, especially our youth this is heartbreaking so we must reach out any way we can to offer support and encouragement to our relatives who are hurting and suffering. We are resilient, we come from strong heart people and we have the ability to save one another. Remember our elders they are the keepers of the wisdom. Build relationships with them. Our traditions and spirituality are our instructions, they come from our ancestors who endured and survived the invasion of these land and 500 years of genocide. I have been incarcerated since Oct. 27, 2016 after being arrested on the frontlines on hwy 1806 north of the Standing Rock Sioux reservation in North Dakota. It has been a long hard journey with important lessons in compassion, humility, and respect. With prayer, as well as the support of so many I am able to remember my grandmother and mothers teachings and i remain strong and grateful. I am humbled and have respect for this life. Thank you for listening, thank you for your strong heart and your understanding of these ways of life. I stand in peace in prayer and in solidarity with our relatives through every struggle. Remember the strength and the lives of our ancestors, they suffered way more for the right to pray to speak our languages and to simply eat and sustain our lives as well as their families lives. Tadodaho Sid Hill (right), Chief of the Onondaga Nation, delivers the ceremonial welcome at the opening of the seventeenth session of the United Nations Permanent Forum on Indigenous Issues. This year's forum centers on the theme: “Indigenous peoples’ collective rights to lands, territories and resources”. Participants of the seventeenth session of the United Nations Permanent Forum on Indigenous Issues speak at the opening. General view of the opening of the seventeenth session of the United Nations Permanent Forum on Indigenous Issues. This year's forum centres on the theme: “Indigenous peoples’ collective rights to lands, territories and resources”.